Too often, hardware vendors overpromise and underdeliver. My experience with the Cobalt Networks Inc. RaQ 3i appliance was the opposite: The RaQ delivered as promised, and then some. Cobalt RaQs are server appliances with the Linux operating system preinstalled and configured for specific Web-oriented enterprise tasks. My review unit was tuned to run database applications via the ChiliSoft ASP emulator for platform-independent use of Microsoft Active Server Pages. ChiliSoft Inc. of Bellevue, Wash., is a Cobalt subsidiary. The RaQ 3i unit I tested came with 512M of dynamic RAM, a 20G hard drive, dual Ethernet ports, an external SCSI port and a single PCI slot. Cobalt's intuitive browser interface lets the administrator change most services and get system statistics. Backups and restorations also can be done from the interface. Preinstalled software, besides the Linux OS, included Apache Web Server, Majordomo list server and SendMail mail server freeware; Microsoft FrontPage extensions; a File Transfer Protocol server; and 128-bit Secure Sockets Layer and Secure Shell Protocol support. An administrator transfers files to the RaQ via FTP and manages it through a browser interface. Cobalt Networks claims a fully functional server can be set up in 15 minutes, but it took me less than five minutes to plug the server into a power source, enter the proper IP address at the front panel and log in from my Linux workstation. Manuals are downloadable in several languages from Cobalt's Web site, at www.cobalt.com. The RaQ 3i is so small that up to 40 of them can fit in a standard 19-inch equipment rack'hence the name. Each appliance can host up to 200 Web sites and consumes about 40 watts, running far cooler than a standard server. No special cooling is needed. The ChiliSoft ASP emulator was ready to run my ASP application, but my ASP application wasn't ready for it. Linux does not get along with Microsoft Access or other Structured Query Language databases, which must first be ported over to the open-source MySQL or other Linux-compatible database managers. You can then set up a data source name for an ASP application and run it as you would on any server under Microsoft Windows NT. Alternatively, you could use the SequeLink driver from Merant International Ltd. of Mountain View, Calif., which can connect to databases under either NT or SunSoft Solaris. Cobalt users can download MySQL at no charge from www.cobalt.com. My only quibble was about the chore of installing MySQL from the Linux command line interface. Installing software on Linux platforms is much cleaner when it arrives in a so-called package, or compressed bundle of files recognized by the .pkg extension. Unfortunately, Cobalt couldn't package the MySQL database because of license restrictions. Cobalt's browser interface was lean and well-designed. Concise help was available for almost every option via mouse rollovers. Even novice administrators should find the interface intuitive. I was comfortable with the system after perusing the menu options for about an hour. From the browser, the administrator can toggle on services including e-mail, FTP, Simple Network Management Protocol and Telnet. 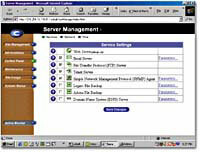 Backups and restorations can also be done from the interface if you install separately purchased software such as Legato NetWorker from Legato Systems Inc. of Mountain View, Calif., or Arkeia from Knox Software Corp. of Carlsbad, Calif.
You also can configure network cards or Media Access Control addresses from the browser interface. Basic system metrics are available through the browser, such as graphical Web and e-mail traffic charts and system status reports on, say, memory usage. More experienced administrators can get into the guts of the server and hack away as much as they like. For high availability, Cobalt charges about an extra thousand dollars for add-on software called StaQware Cluster, a RAID 1 product that bridges two Cobalt servers. It offers full data and hardware redundancy, automatic failure detection and rollover, and real-time data mirroring. Steve Graves, a former GCN reviewer, is publisher of Technical News Service Inc. of Cheverly, Md.